The past years have been marked by the development of stratetcies that enrich meat. Generally, this occurs through research that makes processed food healthier [1Elif Bilek A, Turhan S. Enhancement of the nutritional status of beef patties by adding flaxseed flour. Meat Sci 2009; 82(4): 472-7. [http://dx.doi.org/10.1016/j.meatsci.2009.03.002] [PMID: 20416676] , 2Mapiye C, Aalhus JL, Turner TD, et al. Effects of feeding flaxseed or sunflower-seed in high-forage diets on beef production, quality and fatty acid composition. Meat Sci 2013; 95(1): 98-109. [http://dx.doi.org/10.1016/j.meatsci.2013.03.033] [PMID: 23669875] ] and food that produces netcative appeals on Health, are widely divulged in scientific works and, especially, by the specialized media [3Mapiye C, Aldai N, Turner TD, et al. The labile lipid fraction of meat: from perceived disease and waste to health and opportunity. Meat Sci 2012; 92(3): 210-20. [http://dx.doi.org/10.1016/j.meatsci.2012.03.016] [PMID: 22546816] ]. The change in consumer demand, the acceleration of urban rhythm and increasing global competition are encouraging the meat products industry to develop new technologies and use new ingredients [4Trevisan YC, et al. Efeito da adição de fibra de aveia sobre as propriedades físico-químicas de hambúrguer cozido e congelado com redução de gordura e sal. BrazilianJournalOfFood Technology 2016; 19: 1-8.]. The number of people seeking a healthier, more balanced lifestyle, opting for foods with reduced levels of sodium, fat and enriched with ingredients with functional properties has increased in recent years. The scientific and industrial community in meat sector has been investing in developing new products that meet the demand for products that are easy to prepare and that are healthy [5Bonfim RC, et al. Aplicação de transglutaminase microbiana em produtos cárneos processados com teor reduzido de sódio. Cienc Rural 2015; 45: 1133-8. [http://dx.doi.org/10.1590/0103-8478cr20131440] ]. Depending on the type of product under consideration, a change in composition may have greater or lesser technological, organoleptic and expiry date implications. There are two types of intervention that are performed when changing the constitution of a meat or meat derived products. The first involves reducing a component normally present in the food to more appropriate amounts (fat, salt, nitrite, etc. ); the second is to incorporate ingredients beneficial to health [6Jiménez-Colmenero F, Carballo J, Cofrades S. Healthier meat and meat products: their role as functional foods. Meat Sci 2001; 59(1): 5-13. [http://dx.doi.org/10.1016/S0309-1740(01)00053-5] [PMID: 220625 00] ]. Due to its practicality in preparation and to have nutrients that satisfy hunger quickly, hamburger has become a product consumed by all popular classes [7Oliveira DF, et al. Farinha de linhaça dourada como substituto de gordura animal em hambúrguer de carne bovina com redução de sódio. Braz J Food Technol 2014; 17: 273-82. [http://dx.doi.org/10.1590/1981-6723.0714] ]. It is an industrialized meat product, obtained from butchered animal meat, added or not of adipose tissue and ingredients, moulded and submitted to appropriate technological process. “It is a raw product, semi-fried, cooked, fried, frozen or cooled” according to its classification [8Brasil Instrução Normativa nº 83, de 21 de novembro de 2003 Aprova os retculamentos técnicos de identidade e qualidade de carne bovina em conserva e carne moída de bovino Diário Oficial da União Brasília, DF, 24 de novembro de 2003 ]. The increase in the consumption of chicken meat was influenced by four main factors: replacement of red meat, growing concern with human health, improved coordination of agroindustrial chain of broiler chicken and appearance of new products and brands [9Tonollo M, Palezi SC. Salame de frango funcional com adição de ervas finas e reduzido teor de sal. Unoesc e Ciência 2016; 7: 247-54.]. Chicken meat stands out as lean meat, which has few saturated fats (about 30% vs. 40-50% in red meat) and high proportion of unsaturated fatty acids and polyunsaturated fatty acids (ometca 6), which our body needs. The consumption of chicken meat in Brazil reached 13.6 million tons in 2016 [10 Confederação da Agricultura e Pecuária do Brasil http://wwwcnabrasilorgbr Perspectivas 2017 2016 [13 set 2018]; Disponível em: http://www.cnabrasil.org.br/sites/default/files/sites/default/files/uploads/15_avicultura.pdf]. Due to their functional and technological properties, dietary fiber has been used as a substitute for fat in various meat products [11Schmiele M, et al. Dietary fiber as fat substitute in emulsified and cooked meat model system. Lebensm Wiss Technol 2015; 61: 105-11. [http://dx.doi.org/10.1016/j.lwt.2014.11.037] , 12Talukder S. Effect of dietary fiber on properties and acceptance of meat products: a review. Crit Rev Food Sci Nutr 2015; 55(7): 1005-11. [http://dx.doi.org/10.1080/10408398.2012.682230] [PMID: 24915339] ] with the purpose of adopting intetcrated stratetcies that generate production of accessible products, and at the same time healthy formulations, with properties beneficial to the consumer’s health. Furthermore, the addition of dietary fiber helps to modify general technological and sensory characteristics of a meat system, such as Water Holding Capacity (WHC), fat retention capacity (ORC), and Texture Profile [13Petracci M, et al. Functional ingredients for poultry meat products. Trends Food Sci Technol 2013; 33: 27-39. [http://dx.doi.org/10.1016/j.tifs.2013.06.004] ]. Green bananas (Musa spp.) have a high content of resistant starch and fibers, and a considerable mineral content, since the banana flour is a source of potassium, phosphorus, magnesium, copper, manganese and zinc, when compared to other types of flour available on market [14Dias AR, et al. Massa de empada sem glúten e sem leite, enriquecida com biomassa de banana verde. Nutrição Brasil 2011; 3: 175-8., 15Gonçalves JQ, et al. Secagem da casca e polpa banana verde (Musa acuminata): Propriedades físicas e funcionais da farinha. Global Science and Technology 2016; 9: 62-72.]. The passionfruit peel (Passiflora edulis) is rich in soluble fibers, such as pectin, important in controlling blood levels of glucose and lipids [16Bonfietti NF. Desenvolvimento e análise sensorial de cookies de quinoa enriquecidos com pigmentos naturais. Revista Saúde Unitoledo 2017; 1: 31-46.]. It may aid in preventing gastrointestinal diseases, diabetes and obesity [17Coqueiro AY, Pereira JRR, Galante F. Farinha da casca do fruto de Passiflora edulis f. (maracujá-amarelo): do potencial terapêutico aos efeitos adversos. Rev Bras Plantas Med 2016; 18: 563-9. [http://dx.doi.org/10.1590/1983-084X/15_187] ]. The reduction of sodium intake is a priority issue in the fight against chronic non-communicable diseases in the country, due to its relationship with the risk of hypertension, cardiovascular and renal diseases, among others [18Nilson EAF, Spaniol AM, Gonçalves VSS. A redução do consumo de sódio no Brasil. Cad Saude Publica 2016; 32: 7-11. [http://dx.doi.org/10.1590/0102-311x00102016] ]. The high salt (NaCl) content in meat products can be explained because of its key role in the functionality, microbial stability and sensory properties of the product. NaCl improves water and fat binding characteristics in the formation of a stable gel structure, contributes to the conservation of the product, reducing its water activity, besides increasing perception of salty taste of the product, which is an important factor for acceptance of meat products [19Pietrasik Z, Gaudette NJ. The impact of salt replacers and flavor enhancer on the processing characteristics and consumer acceptance of restructured cooked hams. Meat Sci 2014; 96(3): 1165-70. [http://dx.doi.org/10.1016/j.meatsci.2013.11.005] [PMID: 24334036] ]. Granulometry was carried out in triplicate by sieving 50 g of flour, characterized by the weights of the sieves with the fractions by direct measurements, using a series of standardized sieves in the range of 16 to 200 Mesh, with electromagnetic stirrer (model 3671, Bertel, São Paulo, Brazil) for round sieves The total sieving time was 10 minutes and the analysis was performed in triplicate [20Gusmão RP, Cavalcanti MMERM, Duarte MEM, Gusmão TAS. Particle size, morphological, rheological, physicochemical characterization and designation of minerals in mesquite flour (Proposisjulifrora). J Cereal Sci 2016; 69: 119-24. [http://dx.doi.org/10.1016/j.jcs.2016.02.017] ]. The water content analysis was determined by gravimetric method, using a greenhouse at (105 ± 3)oC until reaching constant weight, in three replications [21Brasil. Normas analíticas do Instituto Adolfo Lutz: Métodos químicos e físicos para análise de alimentos 4. 2005.4.]. Performed by the Novacina equipment, with sample at room temperature (25 ± 3)oC. The analysis was performed in triplicate, according to methodology [21Brasil. Normas analíticas do Instituto Adolfo Lutz: Métodos químicos e físicos para análise de alimentos 4. 2005.4.]. For the analysis of water content, the hamburger was macerated, weighing 3g of the sample in triplicate and using oven at (105 ± 3)oC until reaching constant weight, according to [21Brasil. Normas analíticas do Instituto Adolfo Lutz: Métodos químicos e físicos para análise de alimentos 4. 2005.4.]. To calculate the acidity in normal percent solution, the product was carried out between the volume of 0.1N NaOH solution spent in the titration and the correction factor of 0.1N NaOH solution (1.02); then the ratio of the result to the number of grams of the sample used in the titration was performed [21Brasil. Normas analíticas do Instituto Adolfo Lutz: Métodos químicos e físicos para análise de alimentos 4. 2005.4.]. The determination of the fat content of the hamburgers was carried out by the method of Bligh et al. [22Bligh EG, Dyer WJ. A rapid method of total lipid extraction and purification. Can J Biochem Physiol 1959; 37(8): 911-7. [http://dx.doi.org/10.1139/o59-099] [PMID: 13671378] ]. Previously macerated, 3 g of the samples were weighed into beakers, and 10 ml of chloroform, 20 ml of methanol and 8 ml of distilled water were added. The samples were transferred to hermetically capped glass containers and placed on a rotary shaker for 30 minutes, then 10 ml of chloroform and 10 ml of 1.5% anhydrous sodium sulfate solution were added. Samples were transferred to plastic tubes, capped and centrifuged in a NT-810 micro-processed bench centrifuge at 1000 rpm for 5 minutes to accelerate separation. Filtration was carried out after removal of the supernatant to give a clear solution. From this filtered solution, 4.5 ml (triplicate) were measured in previously tared petri dishes. For chlorides analysis, 5 g of the sample was weighed into a porcelain capsule. Samples were taken to carbonize on electric plate and incinerated in a muff at 550 ° C. After the sample cooled, 30 mL of hot water was added and stirred with glass rod. The solution was transferred with the aid of a funnel into a 100 mL volumetric flask. The capsule, glass stick and funnel were washed with another two 30 mL portions of hot water. The solution and wash water were then transferred to the volumetric flask to cool. The flask volume was completed and then stirred. A 10 mL aliquot was withdrawn from the solution into a 125 mL Erlenmeyer flask. Two drops of the 10% potassium chromate solution were added as an indicator and titrated with 0.1 M silver nitrate solution until a red-brick color appeared [21Brasil. Normas analíticas do Instituto Adolfo Lutz: Métodos químicos e físicos para análise de alimentos 4. 2005.4.]. Using a pachymeter, the diameter of raw and fried hamburgers was measured. The percentage of shrinkage was determined using Equation (3) [23Berry BW. Low fat level effects on sensory, shear, cooking, and chemical properties os ground beef patties. J Food Sci 1997; 57: 537-40. [http://dx.doi.org/10.1111/j.1365-2621.1992.tb08037.x] ]. This analysis was performed in triplicate. A study of Berry [23Berry BW. Low fat level effects on sensory, shear, cooking, and chemical properties os ground beef patties. J Food Sci 1997; 57: 537-40. [http://dx.doi.org/10.1111/j.1365-2621.1992.tb08037.x] ] observed that the flour made from acerola juice residue showed a larger percentage in ≤0.250 mm granulometry. According to Stork et al. [24Storck CR, Basso C, Favarin FR, Rodrigues AC. Microbiological quality and composition of flour from fruit juice production residues with different Granulometrices. Braz J Food Technol 2015; 18: 277-84. ], particle size directly influences water absorption capacity, mixing time and sensory characteristics, such as appearance, taste and texture. The ability of flour to absorb water is related to the distribution of particle size, with smaller particles of flour absorbing more water, and faster, than larger particles [25Borges JTS, Ascheri JTS, Ascheri DR, Nascimento RED, Freitas AS. Propriedades de cozimento e caracterização físico-química de macarrão pré-cozido à base de farinha intetcral de quinoa (Chenopodiumquinoa, Willd) e de farinha de arroz (Oryza sativa, L) polido por extrusão termoplástica. Bol Cent Pesqui Process Aliment 2003; 21: 303-22. [http://dx.doi.org/10.5380/cep.v21i2.1167] ]. Granulometric analysis of green banana biomass and passion fruit peel flours. Physical and physicochemical characterization of green banana biomass and passion fruit peel flours. Excess moisture can cause microbial development which compromises the final quality of the product. The samples showed water content (3) equal to 8.5 and 10.4% for green banana biomass and passion fruit peel flour, respectively. Based on Brazilian standards, these values are acceptable and do not lead to loss of quality in farinaceous. Values accepted in Brazil are up to 14% [26Hoseney RC. Principles of cereal science and technology, St Paul, Minessota: American Association of Cereal Chemists 2010; 288.]. Similar results were evidenced by Brasil [27Brasil Decreto nº 12486, de 20 de outubro de 1978 Normas técnicas especiais relativas a alimentos e bebidas Diário Oficial do Estado de São Paulo São Paulo, SP, 21 de outubro 1978 ] and Lima et al. [28Lima ECS, et al. Análise físico-química de farinhas oriundas de sementes de moringa e pau-ferro Workshop Internacional sobre Água no Semiárido Brasileiro; 2015; Campina Grande, Paraíba 2015.] in watermelon peel flour (9.55%) and ironwood seed flour (9.38%), respectively. Retcarding water activity, values were equal for the two flours (0.5) approaching values thus found by Lima et al. [29Lima JP, Pertela JVF, Marques LE, Alcantra MA, El-Aour AA. Farinha de entrecasca de melancia em biscoitos sem glúten. Cienc Rural 2015; 45: 1688-94. [http://dx.doi.org/10.1590/0103-8478cr20130209] ] to 0.5 passion fruit peel flour. Water activity is an important parameter that shows the availability of water for chemical reactions, enzymes and development of microorganisms in food. Retcarding the chromaticity parameters (a * and b *), it is verified that the samples had values of a * = 9.1 and b * = 19 for banana green biomass flour and a = 4.13 and b * = 24 for passion fruit peel flour in the retcions red and yellow, which in instrumental terms of color are characteristic of positive values for both coordinates. A study [30Ferreira MFP, Pena RS. Estudo da secagem da casca do maracujá amarelo. Rev Bras Prod Agroind 2010; 12: 15-28. [http://dx.doi.org/10.15871/1517-8595/rbpa.v12n1p15-28] ] found values of luminosity (L *) close to 100 (a hundred), parameter a * and b * positive, classifying the yellow albedo passion fruit flour as light, with a slightly red and strongly yellow coloration. Physical, chemical and physicochemical characterization of low-sodium chicken meat hamburgers formulated with passion fruit peel flour and green banana biomass flour. It was observed that F1 presented higher pH due to the absence of fibers. According to Ferreira et al. [31Ferreira MD, Pena RS, et al. Produção e caracterização das farinhas do albedo do maracujá amarelo e da casca de jabuticaba 2016.] the determination of pH and acidity provides valuable data in the assessment of the state of conservation of food. Samples F3 and F4 presented values of 5.20 and 5.4 for pH, respectively. This reduction was justified by the presence of passion fruit peel flour, with 10% in formulation 3 and 5% in formulation 4. The values found for F3 and F4 are below the results of Gonçalves et al. [32Gonçalves JQ, Dasilva MAP, Placido GR, et al. Secagem da casca e polpa da banana verde (Musa acuminata): propriedades físicas e funcionais da farinha 2017; 9: 62-72. ], who found for beef burger and buffalo burger average pH of 5.50 and 5.49 respectively. Values found by Silva et al. [33Silva FL, dos Santos Silva T, Vargas FC, Franzolin R, Trimdade MP. Nota Científica: Características físico-químicas e aceitação sensorial de hambúrguer de búfalo em comparação com hambúrguer bovino. Braz J Food Technol 2014; 17: 340. [http://dx.doi.org/10.1590/1981-6723.2614] ] in burgers using pectin as fat substitute ranged from 4.91 to 5.53. These results were similar to those obtained for F3 and F4 hamburgers in this study. Bilek and Turhan [1Elif Bilek A, Turhan S. Enhancement of the nutritional status of beef patties by adding flaxseed flour. Meat Sci 2009; 82(4): 472-7. [http://dx.doi.org/10.1016/j.meatsci.2009.03.002] [PMID: 20416676] ] studied the effect of oat fiber addition on physicochemical properties of cooked and frozen hamburger with reduced fat and salt and found pH values ranging from 6.02 to 6.30. These results approximate the results obtained for the F2 formulation of this work. 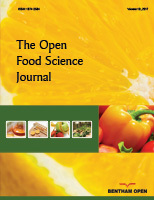 The burgers prepared in this study had water content of 62 and 73.3%, the lowest value assigned to F3 formulation when using flour of passion fruit peel. This difference can be related to the amount of fat that is inversely proportional to water content. Araújo et al. [34Araújo BS. Elaboração de hambúrgueres utilizando pectina como substituto de gordura.Congresso Brasileiro de Química 2016.] found in beef hamburger in natura with 5% flax flour water content equal to 62.95% approaching the values found for the standard formulation F1. Retcarding ashes, results ranged from 2.40 to 3.2 [35Oliveira DF. Farinha de linhaça dourada como substituto de gordura animal em hambúrguer de carne bovina com redução de sódio. Braz J Food Technol 2014; 17: 273-82. [http://dx.doi.org/10.1590/1981-6723.0714] ]. Oliveira et al. used burgers made from buffalo meat enriched with orange fiber and found values ranging from 2.84 to 3.26. As for the color analysis, there was a significant difference between all samples. It was observed that hamburger F1 and F3 presented higher values in luminosity (L * = 57.0 and L * = 55, respectively) resulting in a lighter burger. This observation justifies the slight visual similarity of the hamburger enriched with passion fruit peel flour with a standard hamburger with no flour. In relation to chromaticity, the observed values of a * ranged from 2.7 to 9.0 and b * from 13.3 to 32.3 [36Sousa LN, Junior JD, de Sousa FF, Joele MS, Costa VV, Noronra GA. Desenvolvimento e determinação da qualidade de hambúrguer de carne de búfalo enriquecido com fibra de laranja. Revista Brasileira de TecnologiaAgroindustrial 2016; 16: 2052-63.]. Sousa et al. found a = 9.13 and b * = 10.45 in beef hamburger cooked with partial replacement of pork fat or processing residues of pineapple and canola oil. The values for lipid content ranged from 0.8 to 1.1%, and are in accordance with MAPA Hamburger Quality and Identity Technical Retculation [37Selani MM, Shirado GA, Margiotta GB, et al. Effects of pineapple byproduct and canola oil as fat replacers on physicochemical and sensory qualities of low-fat beef burger. Meat Sci 2016; 112: 69-76. [http://dx.doi.org/10.1016/j.meatsci.2015.10.020] [PMID: 26562792] ] which recommends a maximum of 23% fat. The reduction of fat content in relation to the standard sample can be explained by the addition of fiber rich flours in formulations. The hamburger enriched with green banana biomass flour was distinguished by its lower content of lipids. Selani et al. [38Brasil Resolução RDC nº 28, de 28 de março de 2000 Procedimentos básicos de Boas Práticas de Fabricação em estabelecimentos beneficiadores de sal destinado ao consumo humano e o roteiro de inspeção sanitária em indústrias beneficiadoras de sal Diário Oficial da União, Brasília, DF, 30 de março de 2000 2000.] in buffalo burgers with added orange fiber found a significant increase in fat compared to a standard sample. Texture analysis of reduced-sodium chicken meat burgers formulated with passion fruit peel and green banana biomass flours. According to Huang et al. [39Huang SC, Tsai YF, Chen CM. Effects of wheat fiber, oat fiber, and inulin on sensory and physic-chemical properties of Chinese-style sausages. Asian-Australas J Anim Sci 2011; 24: 875-80. [http://dx.doi.org/10.5713/ajas.2011.10317] ], hardness represents one of the most important parameters of meat product texture, influencing the consumer's preference. The size and number of muscle fibers, as well as their composition and distribution, directly influence the meat texture parameters [40Listrat A, Lebret B, Louveau I, et al. How muscle structure and composition influence meat and flesh quality. Sci World J 2016; 2016: 3182746. [http://dx.doi.org/10.1155/2016/3182746] [PMID: 27022618] ]. Lima et al. [28Lima ECS, et al. Análise físico-química de farinhas oriundas de sementes de moringa e pau-ferro Workshop Internacional sobre Água no Semiárido Brasileiro; 2015; Campina Grande, Paraíba 2015.] report that hardness reduces with increasing fat content in hamburgers. For chewability in hamburgers made with 5% of blood plasma Claudino and Bertolini [41Claudino FB, Bertoloni W. Perfil de textura e composição de hambúrgueres elaborados com diferentes teores de gordura e plasma sanguíneo bovino. Arch Vet Sci 2013; 18: 1-8. [http://dx.doi.org/10.5380/avs.v18i2.26562] ] found a value of 5417.02. López-Vargas et al. [42López-Vargas JH, Fernández-López J, Pérez-Álvarez JÁ, Viuda-Martos M. Quality characteristics of pork burger added with albedo-fiber powder obtained from yellow passion fruit (Passiflora edulis var. flavicarpa) co-products. Meat Sci 2014; 97(2): 270-6. [http://dx.doi.org/10.1016/j.meatsci.2014.02.010] [PMID: 24607997] ] in boiled pork burgers plus 2.5% albedo of passion fruit, found a cohesiveness of 0.36. Formulation 4 presented a value close to 0.4. Analysis of yield and shrinkage of reduced sodium chicken meat burgers formulated with passion fruit peel flour and green banana biomass flour. The F4 hamburger (with the mix of green banana biomass and passion fruit peel flour) presented the highest cooking yield in this study, being 87% when compared to the standard sample that is free of flour. In relation to shrinkage percentage, F2 sample (with green banana biomass flour) presented a lower value for this parameter, which means a great advantage at industrial level [43Gomes AS, Nomkil RE, Sena CP, Martins M, Medeiros CM, et al. Desenvolvimento e avaliação sensorial de hambúrguer bovino enriquecido com resíduos da castanha-do-brasil (BERTHOLLETIA EXCELSA HBK). ScientiaAmazonia 2018; 1: 1-5.]. found values of yield and shrinkage of 88% and 25%, respectively, for bovine burger enriched with Brazil nut residues. Brasil. Normas analíticas do Instituto Adolfo Lutz: Métodos químicos e físicos para análise de alimentos 4. 2005.4.